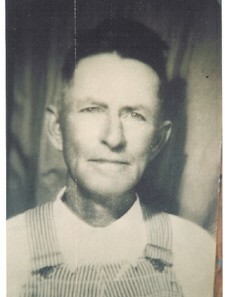 Robert E. Lee WALKER [Parents] was born on 9 Oct 1865 in , , Louisiana. He died on 1 Oct 1949 in Vanoss, Pontotoc, Oklahoma. He was buried on 4 Oct 1949 in Midland Cemetery, Pontotoc, Oklahoma. Robert married Rebecca Kisar "Beck" ROBERTS on 21 Dec 1899 in Center, I.T., Pontotoc, Oklahoma. 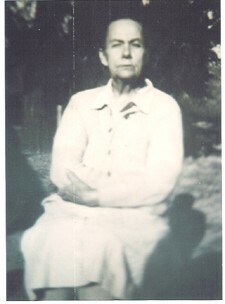 Rebecca Kisar "Beck" ROBERTS [Parents] was born on 9 Feb 1876 in Griffin, Conway, Arkansas. She died on 16 Aug 1928 in In Her Home Midland, Vanoss, Pontotoc, Oklahoma. She was buried on 18 Aug 1928 in Midland Cemetery, Pontotoc, Oklahoma. Rebecca married Robert E. Lee WALKER on 21 Dec 1899 in Center, I.T., Pontotoc, Oklahoma. M i Edward Lee WALKER was born on 24 Sep 1900. He died on 9 Dec 1964. W. Jess WALKER was born about 1901 in Indian Territory, Center, Pontotoc, Oklahoma. Myrtle Mae WALKER was born on 23 Nov 1901 in Indian Territory, Vanoss, Pontotoc, Oklahoma. She died on 10 Aug 1903 in Indian Territory, , Pontotoc, Oklahoma. F v Beulah Estelle WALKER was born on 22 Jul 1904. She died on 26 Mar 1982. John WALKER was born about 1905 in Indian Territory, Vanoss, Pontotoc, Oklahoma. F vii Nora Alice WALKER was born on 7 Apr 1907. She died on 20 Mar 1999. M viii Lonnie Jackson WALKER was born on 8 Jan 1908. He died on 18 Jul 1958. Mary Eve WALKER was born about 1910 in Vanoss, Pontotoc, Oklahoma. F x Lois Marie WALKER was born on 9 Mar 1912. She died on 20 Nov 1982. F xi Vird WALKER was born on 17 Jun 1914. She died on 31 May 2008. Earnest Edward SUTTON [Parents] was born on 5 Apr 1876 in , Conway, Arkansas. He died on 6 Feb 1945 in Ada, Pontotoc, Oklahoma. He was buried in Ada, Pontotoc, Oklahoma. 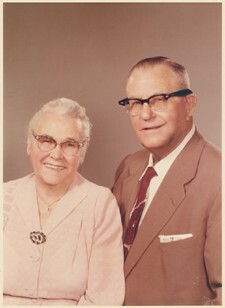 Earnest married Ellen Jane ROBERTS on 22 Oct 1901 in Bebee, I. T., Oklahoma, F-65-l493. Ellen Jane ROBERTS [Parents] was born on 17 Aug 1879 in , Conway, Arkansas. She died on 15 Feb 1952 in Oil Center, Pontotoc, Oklahoma. She was buried on 18 Feb 1952 in Maxwell Cemetery, Pontotoc, Oklahoma. Ellen married Earnest Edward SUTTON on 22 Oct 1901 in Bebee, I. T., Oklahoma, F-65-l493. M i Abner Otis SUTTON was born on 17 Sep 1902. He died on 25 May 1984. F ii Mary Beatrice SUTTON was born on 19 Feb 1904. She died on 9 May 1933. M iii William Pleasant SUTTON "Sr." was born on 19 Nov 1906. He died on 14 Dec 1982. F iv Beulah Gertie SUTTON was born on 17 Jul 1909. F v Floy Lillian SUTTON was born on 12 Jun 1912. She died on 3 May 1997. M vi Willis Edward SUTTON was born on 5 Jul 1914. He died on 13 Feb 1972. M i John RYAN "III". John Henry ROBERTS [Parents] was born on 29 Oct 1877 in , Conway, Arkansas. He died on 20 Mar 1966 in Ada, Pontotoc, Oklahoma. He was buried on 23 Mar 1966 in Rosedale Cemetery, Ada, Pontotoc, Oklahoma. John married Marguerite Etta STAFFORD on 31 Mar 1898 in Center, Indian Territory [now Pontotoc], Oklahoma. Marguerite Etta STAFFORD [Parents] was born on 6 Nov 1881 in , Conway, Arkansas. She died on 30 Dec 1970 in Ada, Pontotoc, Oklahoma. She was buried on 2 Jan 1971 in Rosedale Cemetery, Ada, Pontotoc, Oklahoma. Marguerite married John Henry ROBERTS on 31 Mar 1898 in Center, Indian Territory [now Pontotoc], Oklahoma. M i Odis Elmo ROBERTS was born on 28 Apr 1899. He died on 1 Apr 1971. M ii Olan Henry ROBERTS was born on 8 Jul 1901. He died on 31 Jan 1977. F iii Floy Lilian ROBERTS was born on 20 Oct 1904. She died on 4 Oct 1995. F iv Lois Vivian ROBERTS was born on 25 Nov 1906. Minnie Ruby ROBERTS was born in May 1913. She died on 10 Feb 1915. She was buried in Rosedale Cemetery, Ada, Pontotoc, Oklahoma. M vi Opal Ovell ROBERTS was born on 2 Mar 1916. He died on 14 Jul 1963. M vii Oris Wilma ROBERTS "Sr" was born on 24 Oct 1920. He died on 13 Nov 2001. STAFFORD was born in , , Georgia. STAFFORD married UNKNOWN. UNKNOWN was born in , , Georgia. UNKNOWN married STAFFORD. F i Marguerite Etta STAFFORD was born on 6 Nov 1881. She died on 30 Dec 1970. Rev. Ellis Melvin ROBERTS [Parents] was born on 1 Mar 1881 in Robertsville, Conway, Arkansas. He was christened in Penecostal Holiness Church. He died on 18 Nov 1967 in Tulsa, Tulsa, Oklahoma. He was buried on 20 Nov 1967 in Tulsa, Tulsa, Oklahoma. Ellis married Claudius Precilla IRWIN on 17 Feb 1901 in Center, Indian Territory [Now Pontotoc County], Oklahoma. Claudius Precilla IRWIN [Parents] was born on 25 Mar 1885 in Russellville, Pope, Arkansas. She was christened in Penecostal Holiness Church. She died on 17 Apr 1974 in Tulsa, Tulsa, Oklahoma. She was buried on 20 Apr 1974 in Tulsa, Tulsa, Oklahoma. Claudius married Rev. Ellis Melvin ROBERTS on 17 Feb 1901 in Center, Indian Territory [Now Pontotoc County], Oklahoma. M ii Elmer Pleasant ROBERTS was born on 26 Mar 1905. He died on 25 Sep 1995. F iii Jewel Lee ROBERTS was born on 9 Nov 1910. She died on 14 Jul 2000. M iv Loyd Vaden ROBERTS was born on 8 Oct 1915. He died on 6 May 2004. M v Rev. Granville Oral ROBERTS was born on 24 Jan 1918. He died on 12 Dec 2009. Franklin Jefferson IRWIN [Parents] was born on 2 Feb 1853 in Palo Pinto, Palo, Texas. He died in 1904/1908 in Velma, Stephens, Oklahoma. Franklin married Demarius H. HOLTON on 23 Nov 1874. Demarius H. HOLTON [Parents] was born on 20 Dec 1858 in , Decatur, Georgia. She died on 26 Mar 1939 in , Pontotoc, Oklahoma. She was buried in Ada, Pontotoc, Oklahoma. Demarius married Franklin Jefferson IRWIN on 23 Nov 1874. Andrew J. IRWIN was born about 1876 in , , Texas. William E. "Sam" IRWIN was born about 1879. F iii Clara Arizona IRWIN was born in Nov 1881. She died on 17 Aug 1942. F iv Claudius Precilla IRWIN was born on 25 Mar 1885. She died on 17 Apr 1974. F v Maud IRWIN was born on 22 Apr 1887. She died on 17 Aug 1971. F vi Artie IRWIN was born in Nov 1889. M vii Luther A. "Lute" IRWIN was born in Jul 1891. He died on 31 Jul 1970. F viii Effie IRWIN was born in Jan 1894. Barney L. IRWIN was born in 1901 in Ada, Pontotoc, Oklahoma (Indian Territory). He died on 8 Dec 1916 in Oklahoma City, Oklahoma, Oklahoma. Holly B. IRWIN was born in 1903 in Ada, Indian Territory, Oklahoma. Chad WEAVER. Chad married Cindy Elizabeth YOUNG. Cindy Elizabeth YOUNG [Parents] was born on 15 Jan 1973 in Deming, Luna, New Mexico. Cindy married Chad WEAVER. Walter Augustus PAPIZAN [Parents] was born in 1755 in Nice, Alpes-Martitmes, Provence-Alpes-Cole d'Azur, France. He died on 4 Jun 1830 in Tuscaloosa, Tuscaloosa, Alabama. He was buried in Tuscaloosa, Tuscaloosa, Alabama. Walter married Abigail Belle LAZADOR on 25 Jan 1799 in John Street Church, Albany, New York, New York. Abigail Belle LAZADOR was born in 1777 in , , Maryland. She died in 1830 in , Tuscaloosa, Alabama. Abigail married Walter Augustus PAPIZAN on 25 Jan 1799 in John Street Church, Albany, New York, New York. F i Harriett PAPIZAN was born in 1801. She died on 15 Dec 1877. F ii Diannah Orana Lefre PAPIZAN was born in 1811. She died in 1862. M iii Benjamin Voltaire "Walter" PAPIZAN was born in 1814. He died in 1891. M iv Leroy Pope PAPIZAN "Sr" was born in 1815. He died in 1859. F v Mariah PAPIZAN was born in 1817. She died in 1852. Benjamin MADDOX "II" [Parents] was born in 1735 in Charles City, Charles, Maryland. He died in 1811 in , Abbeville, South Carolina. Benjamin married Elizabeth MC KENZIE in 1756 in , Charles, Maryland. Elizabeth MC KENZIE was born in 1740 in , Charles, Maryland. She died in 1784. Elizabeth married Benjamin MADDOX "II" in 1756 in , Charles, Maryland. Walter MADDOX was born about 1757 in , , South Carolina. Lanty MADDOX was born about 1758 in , , South Carolina. M iii Thomas MADDOX was born about 1759. He died in 1805. John MADDOX was born about 1760 in , , South Carolina. He died before 1810 in , , South Carolina. M v Hendley MADDOX was born in 1761. He died on 10 Jun 1806. M vi Benjamin MADDOX "III" was born in 1770. He died in 1764. M vii William MADDOX was born in 1776. He died in 1867. M viii Chandler C. MADDOX was born in 1780. He died on 4 Dec 1872. M ix Charles MADDOX was born in 1781. He died in 1850. M x Benjamin Lawson MADDOX was born in 1784. He died in 1860. M xi Henry MADDOX "Sr" was born in 1785. He died on 29 May 1839.